Heat oil in kadai, shallow fry small onions (shallots), till golden brown. Add cumin seeds, hing, green chilly paste, garlic paste, ginger paste, saute for 1 / 2 minute. Add blanched, chopped tomatoes, saute 4 to 5 minutes. Add turmeric powder, salt, red chilly powder, coriander powder, cumin powder, cloves powder, cinnamon powder, sugar mix well. Add water, cook for 3 to 4 minutes on slow flame. Add gathiya (thick sev), mix well. Cook for 1 to 2 minutes. 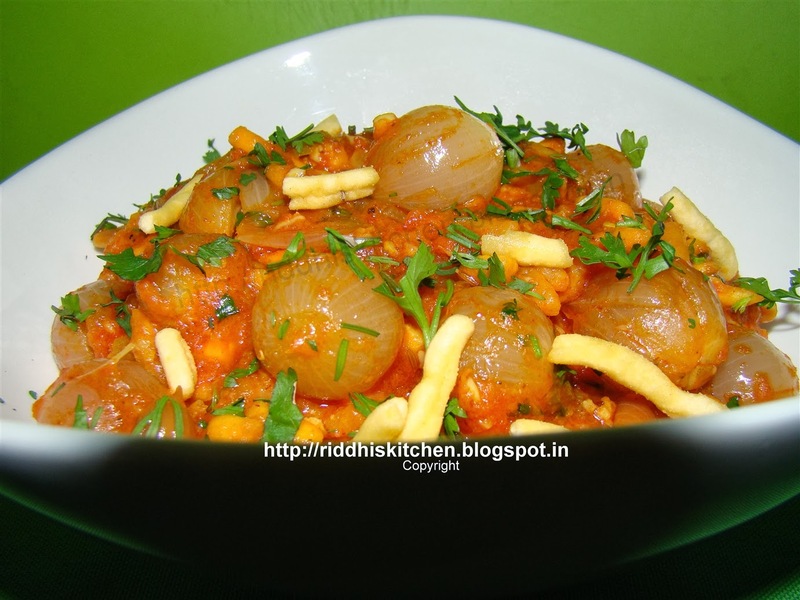 Take serving bowl, pour sabji and garnish with fresh coriander leaves, serve hot with thepla or roti or bajre ki roti.